Liposuction, also known as lipoplasty or suction-assisted lipectomy, is cosmetic surgery performed to remove unwanted deposits of fat from under the skin. The doctor sculpts and recontours the patient's body by removing excess fat deposits that have been resistant to reduction by diet or exercise. The fat is permanently removed from under the skin with a suction device. Liposuction does not remove large quantities of fat and is not intended as a weight reduction technique. The average amount of fat removed is about a liter, or a quart. Although liposuction is not intended to remove cellulite (lumpy fat), some doctors believe that it improves the appearance of cellulite areas (thighs, hips, buttocks, abdomen, and chin). Liposuction is most successful on patients who have firm, elastic skin and concentrated pockets of fat in cellultite areas. To get good results after fat removal, the skin must contract to conform to the new contours without sagging. Older patients have less elastic skin and therefore may not be good candidates for this procedure. Patients with generalized fat distribution, rather than localized pockets, are not good candidates. Patients should be in good general health and free of heart or lung disease. Patients with poor circulation or who have had recent surgery at the intended site of fat reduction are not good candidates. Most liposuction procedures are performed under local anesthesia (loss of sensation without loss of consciousness) by the tumescent or wet technique. 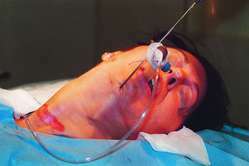 In this technique, large volumes of very dilute local anesthetic (a substance that produces anesthesia) are injected under the patient's skin, making the tissue swollen and firm. Epinephrine is added to the solution to reduce bleeding, and make possible the removal of larger amounts of fat. The doctor first numbs the skin with an injection of local anesthetic. After the skin is desensitized, the doctor makes a series of tiny incisions, usually 0.12-0.25 in (3-6 mm) in length. The area is then flooded with a larger amount of local anesthetic. Fat is then extracted with suction through a long, blunt hollow tube called a cannula. The doctor repeatedly pushes the cannula through the fat layers in a radiating pattern creating tunnels, removing fat, and recontouring the area. Large quantities of intravenous fluid (IV) is given during the procedure to replace lost body fluid. Blood transfusions are possible. The cost of liposuction can vary depending upon the standardized fees in the region of the country where it is performed, the extent of the area being treated, and the person performing the procedure. Generally, small areas, such as the chin or knees, can be done for as little as $500, while more extensive treatment, such as when hips, thighs, and abdomen are done simultaneously, can cost as much as $10,000. These procedures are cosmetic and are not covered by most insurance policies. After the surgery, the patient will need to wear a support garment continuously for 2-3 weeks. If ankles or calves were treated, support hose will need to be worn for up to 6 weeks. The support garments can be removed during bathing 24 hours after surgery. A drainage tube, under the skin in the area of the procedure, may be inserted to prevent fluid build-up. Mild side effects can include a burning sensation at the site of the surgery for up to one month. The patient should be prepared for swelling of the tissues below the operated site for 6-8 weeks after surgery. Wearing the special elastic garments will help reduce this swelling and help to achieve the desired final results. The incisions involved in this procedure are tiny, but the surgeon may close them with stitches or staples. These will be removed the day after surgery. However, three out of eight doctors use no sutures. Minor bleeding or seepage through the incision site is common after this procedure. Wearing the elastic bandage or support garment helps reduce fluid loss. This operation is virtually painless. However, for the first postoperative day, there may be some discomfort which will require light pain medication. Soreness or aching may persist for several days. The patient can usually return to normal activity within a week. Common entry sites for liposuction procedures. Postoperative bruising will go away by itself within 10-14 days. Postoperative swelling begins to go down after a week. It may take 3-6 months for the final contour to be reached. 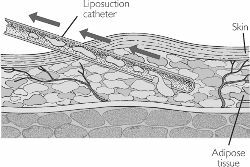 Liposuction under local anesthesia using the tumescent technique is exceptionally safe. A 1995 study of 15,336 patients showed no serious complications or deaths. Another study showed a 1% risk factor. However, as with any surgery, there are some risks and serious complications. Death is possible. Staying in bed increases the risk of clot formation, but not getting enough rest can result in increased swelling of the surgical area. Such swelling is a result of excess fluid and blood accumulation, and generally comes from not wearing the compression garments. If necessary, this excess fluid can be drained off with a needle in the doctor's office. If too much fat is removed, the skin may peel in that area. Smokers are at increased risk for shedding skin because their circulation is impaired. Another and more serious hazard of removing too much fat is that the patient may go into shock. Fat tissue has an abundant blood supply and removing too much of it at once can cause shock if the fluid is not replaced. The loss of fat cells is permanent, and the patient should have smoother, more pleasing body contours without excessive bulges. However, if the patient overeats, the remaining fat cells will grow in size. Although the patient may gain weight back, the body should retain the new proportions and the suctioned area should remain proportionally smaller. In some instances, the skin may appear rippled, wavy, or baggy after surgery. Pigmentation spots may develop. The recontoured area may be uneven. This unevenness is common, occurring in 5-20% of the cases, and can be corrected with a second procedure that is less extensive than the first. Taylor, Mia, Lloyd A. Hoffman, and Michael Lieberman. "Intestinal Perforation after Suction Lipoplasty: A Case Report and Review of the Literature." Annals of Plastic Surgery 38, no. 2: 169-172. American Society of Aesthetic Plastic Surgery. (888) 272-7711. Lipoplasty Society of North America. (800) 848-1991. Cellulite — Cellulite is dimply skin caused by uneven fat deposits beneath the surface. Epinephrine — Epinephrine is a drug that causes blood vessels to constrict or narrow. It is used in local anesthetics to reduce bleeding. Hemoglobin — Hemoglobin is the component of blood that carries oxygen to the tissues. Liposhaving — Liposhaving involves removing fat that lies closer to the skins surface by using a needle-like instrument that contains a sharp-edged shaving device. Tumescent technique — The tumescent technique of liposuction involves swelling, or tumescing, the tissue with large volumes of dilute anesthetic. Method of removing unwanted subcutaneous fat using suction cannulae inserted through short, strategically placed incisions; used in body contouring. A cosmetic surgical procedure in which excess fatty tissue is removed from a specific area of the body, such as the thighs or abdomen, by means of suction. Also called suction lipectomy. plastic surgery that removes adipose tissue with a suction pump device. It is used primarily to remove or reduce localized areas of fat around the abdomen, breasts, legs, face, and upper arms where the skin is contractile enough to redrape in a normal manner. Also called suction lipectomy. Suction-assisted lipectomy Cosmetic surgery A technique for removing focal fat deposits. See Body sculpting, Cosmetic surgery, Tumescent liposuction. Cf Liposhaving. Method of removing unwanted subcutaneous fat using percutaneously placed suction tubes. Q. What do you think about liposuction? Is it a safe operation? Is it affective in the long run? A. Liposuction is an operation that changes your body. It is done if there are no other ways and you gained so much weight that it’s dangerous. It is not an “easy way to loose weight”. It has consequences – there are 2 kinds of fat tissues- the one that is outside and the internal one. If you will remove fat cells from the exterior and the fat that will enter your body from now on will have to be distributed in the interior. And that is not good. This is the problematic fat- the one that does most of the truble. Q. What are the dangers of a liposuction procedure? I am nervous about my decision to do liposuction and wanted to know more about the risks in this procedure. Complications from liposuction hit the headlines in 2009 when Denise Hendry, the wife of former Scotland footballer Colin Hendry, died after bacteria spread from her stomach to her brain causing meningitis. The team found that a 45-year-old woman developed a serious life threatening condition after having liposuction. The number of patients undergoing liposuction surgery has increased by 50% since 2011, when 89 people received the treatment at a cost of [euro]437,799. We will thoroughly review any and all medical and surgery histories to ensure that liposuction is the best alternative, and to help gauge the results for each individual patient. However, it's fair to say that the skin usually contracts after the fat is removed following liposuction, resulting in an uplifting effect. Non-systematic review of the literature using the PubMed and Medline databases, introducing key words in English like Fluid Management, Liposuction, pulmonary oedema, larger infiltration, Aspiration volumes. According to Dr Parashar, though liposuction is mostly preferred by women, there has been a 20 per cent increase in men seeking the procedure. Dr Punam Bijlani was one of the key speakers at the sixth International Congress in Aesthetics, Anti-Ageing Medicine and Medical Spa held in Dubai recently, where she presented the latest techniques for liposuction. He said: "Lisa told my best man about the liposuction as she was worried he might have paint-balling planned for my stag night. According to plastic surgeons, liposuction now heads the cosmetic operations that people are undertaking followed by abdominal tightening, breast reduction then rhinoplasty.